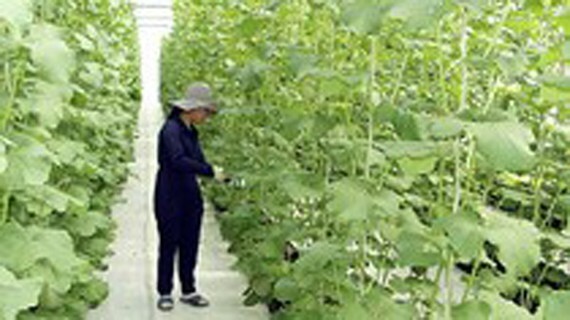 The Ho Chi Minh City Agricultural Hi-tech Park (AHTP) announced on October 30 that its research center was successful in cross-breeding 4 new short-term types of the species of cantaloupe, cucumber, chilli pepper, and bitter gourd. After the announcement, AHTP has presented the new seeds to the Ho Chi Minh City (HCMC) Farmer’s Union. According to Dr. Do Viet Ha, Deputy Director of the AHTP’s Management Board, thanks to applying the new electrophoresis technology to indirectly evaluate as well as to analyze the purity of genomes, AHTP was able to filter different types of species so that they can create a suitable type in 3 years instead of 5 years like usual. In this event, AHTP introduced 5 successful models of plant growing which implement high technologie, They have been piloted for the past 5 years in 30 provinces and cities around the Mekong Delta, HCMC, and southeast regions. They are used to cultivate vegetables like mustard and lettuce or cantaloupe, chilli pepper in net houses, and then processing these kinds of produce in a closed chain which meets safety standards. These models have been approved as a national advanced technology by the Department of Crop Production, a member of the Ministry of Agriculture and Rural Development.